An online one-of-a-kind shop, When It's Gone It's Gone, is selling this Royal Navy ejector seat for use as an office desk-chair. Our Martin Baker Mk6 ejector seat for sale, originally used in a Royal Navy Buccaneer, has been fitted with a stainless steel frame, transforming it into the unique seat it is today! Complete with original 'chutes, harness and eject handles, the seat is guaranteed to turn heads in the office or look great at home! The Mk.6MSB was fitted to the Buccaneer jet used by both RAF and Royal Navy. This seat in particular was fitted to XV157 which flew first with the Royal Navy from '66, including operating from the aircraft carrier HMS Eagle (where its was coded 107/E) and RAF squadrons from '69. XV157 was sadly scrapped in '91, at which point this seat was removed and converted to a training seat. 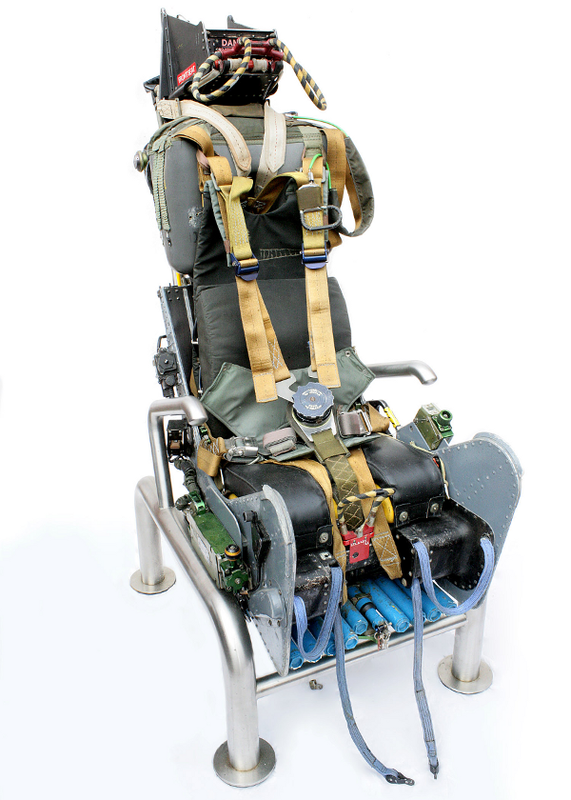 The ejector seat has been kept in its original authentic condition to preserve its' history; parts are original to the chair, including straps, parachute, seat cushion and handles. Paintwork has been kept as the original. Rockets are present - including pitch rockets - minus cartridge and propellant. I want one of these. I'm not a big military fan, but I think this is pretty cool, and I'm in need of an office chair for by the computer at home. The only change I'd request is casters. Those flat feet will rip up our flooring in next to no time. Oh yes, and the price is "make us an offer and we'll see if we like it" kind of price.